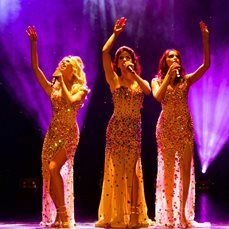 In this 60’s themed show, The Stone Gold girls sing all your favourites sixties hits from ‘The Beatles’ to ‘The Supremes’, all with stunning costume changes, fantastic vocal harmonies. And swinging sixties moves. This fabulous show by these highly skilled performers can be hired for all types of corporate and private events like corporate parties, balls, product launch parties, film premieres, anniversaries and weddings. These corporate entertainers really know how to get people on the dance floor!